Each occasion has been different in its presentation and content as well as consistent in quality, taste and variation… it never disappoints and we have been introduced to French cuisine both modern and traditional… all absolutely sublime! Just a quick note to say a big ‘Merci Beaucoup’ for a wonderful meal last night. Yves did a fantastic job and all of us enjoyed the food immensely. And the kitchen was so tidy afterwards – such a treat! Thank you for the most delicious dinner on the 29th. It really was wonderful and everyone enjoyed the food tremendously. I will certainly be in touch in the future. I was lucky enough to have ‘French Chef at Home’ cater for my 40th birthday dinner. The food was absolutely sensational – the highlights, to name a few, being the Roasted Angus Beef with chestnuts and the Louis XV dessert with home made ice cream… It was great fun to have Yves and his colleague Noel around and we were all amazed at the way they just turned up and fitted in. Behind the scenes, Anne was enormously helpful and patient as we refined the menu. I wouldn’t hesitate to recommend this fabulous team for any special event. Was very impressed by Yves. I have munched my way across large parts of Europe in some very well regarded eating houses, and his efforts compare very favourably with the best. He certainly deserves to succeed in his venture. Just a quick note to thank Yves for a splendid meal last night. We had pretty high expectations but they were surpassed by a long way. Everything was excellent. We loved everything but the main course and dessert were especially nice. We appreciated the chance to take the meal at our own pace and it’s a real treat to come back into a clean kitchen with no washing up. Our guests were very impressed too and I shall be telling all my colleagues at work in Leeds. Best wishes for a Joyeaux Noel. On behalf of Julia & myself I just wanted to thank you both for a fantastic evening on Friday. Yves, your food was amazing, the quality, presentation and service were second to none. All our guests were highly complementary and said what a wonderful evening they had all had. So thank you both for all your efforts we will most certainly use you for future entertaining. Please also pass on our thanks to Noel who helped to make the evening a truly great one. Thank you Yves, Gosia and Anne for a superb dinner at ours last Saturday. Our guests were delighted with the delicious food and the service…. and as hosts, we could really relax and enjoy our party as well. 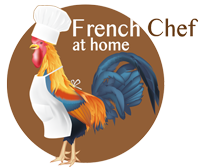 😉 doing business with French Chef at Home was a pleasure from the first contact and the cook was very accommodating to our guests’ dietary requirements. We loved the experience – thanks! Due to living in Paris now, I don’t know many people who live in the area any more, but I’ll be sure to recommend you to anyone who visits. What a wonderful meal we had on Saturday. The children and partners had a wonderful evening and enjoyed every part of the meal. My son said it was better then the Box Tree in Ilkley. High praise indeed.I shall certainly recommend you to friends and find some excuse to have you come over again to cook for us. Thank you again. A memorable evening and thank you for your patience with Yogi. Thank you to Yves and his team for providing delicious food and great service for my surprise 60th birthday dinner last Saturday. All our guests loved their food and the pace it was served to us. It gave us the perfect opportunity to enjoy tasty well presented food in our own home. Thank you. Fabulous mouth watering, delicious meal prepared by Yves last night, his attention to detail is incredible, highly recommended! Thank you Yves and Anne for making our Birthday very special ! Thank you very much for visiting our vacation home in the Lake District to cook for us. Noel did a great job looking after us and the food was simply magnificent. A couple of our group said that the meal was one of the best they had ever had. We were very impressed overall with the quality and ease of the service you provided and would highly recommend you to others.